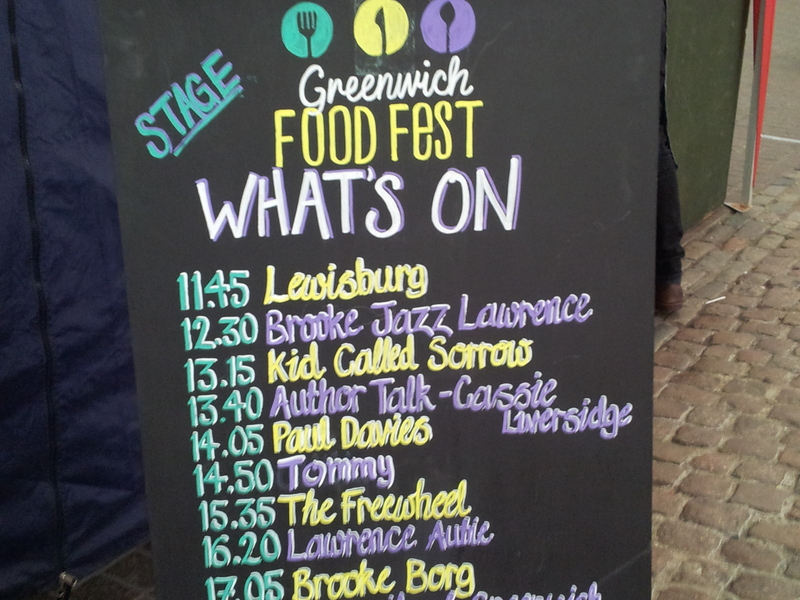 The Greenwich Food Fest, London – Why Waste Annual Leave? 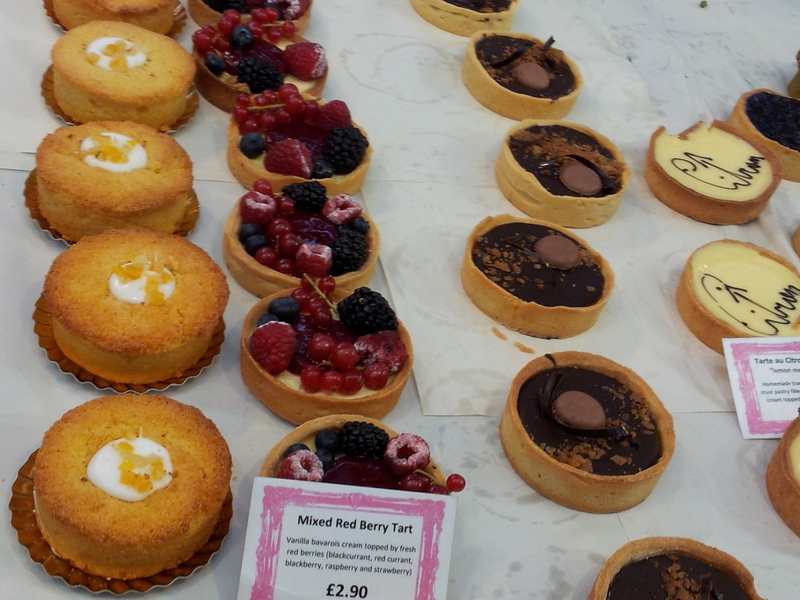 I do love an afternoon at Greenwich Market, particularly at lunch time when the array of foods leaves me spoiled for choice and devoid of cash – I’ve actually had a post in the pipelines about the market for months, just waiting to be spell-checked and decorated before I publish it (such are the challenges of juggling the blog with a job). Given it is essentially walking distance from home, I would go more often if it wasn’t for the crowds – either I’m getting agoraphobic or just plain cranky in my old age but when I heard this event was happening on a weekday, I leaped at the chance to head to the Greenwich market premises, free of crowds, to snoop around the Greenwich Food Fest. This one day, one-off event coincided with half term and was organised by a group of local students with the proceeds going to Greenwich Food Bank. There were a few familiar faces from usual Greenwich Market vendors but by and large, the stalls were fresh and unfamiliar to me, such as Bee Mercy, selling delicious honey in a variety of flavours including citrus and eucalyptus. I toyed with having the pork meatball sandwiches, the £5 charcuterie and cheese deli board or the huge sausage rolls with perfectly flaky pastry. 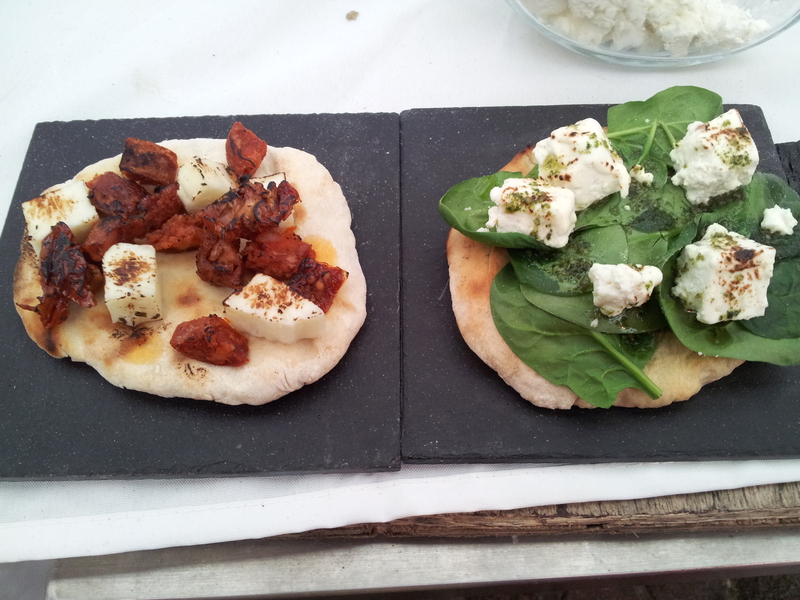 Clearly in the mood for pork, I ultimately opted for the chorizo and halloumi small flatbread, which was heated in front of me and finished off with a blitz from the blow torch. 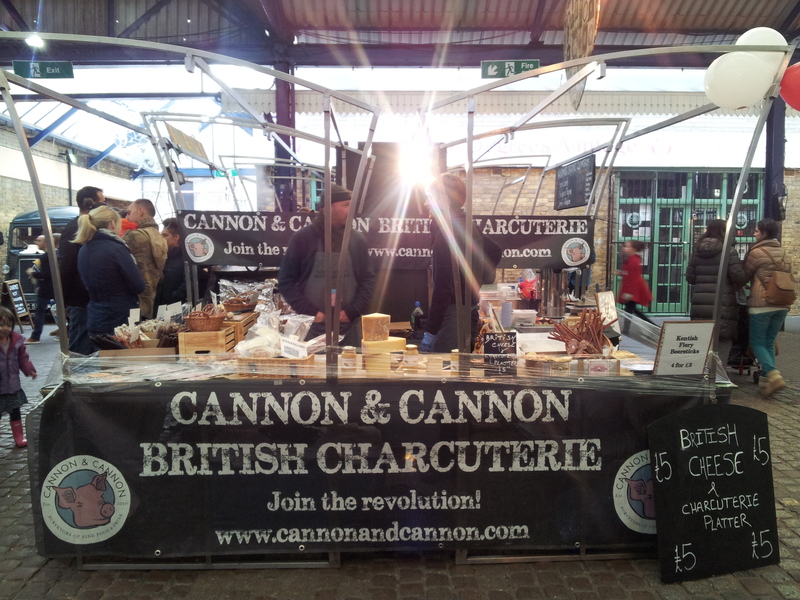 Other tempting choices including Stilton and caramelised onions. Portion size was small so it amounted to only a starter of course, leaving me half a stomach’s worth of space to try out the crispy Bhel Puri from the Indian street food stall – I’ve grown up eating this stuff and it just never gets old. The stalls were essentially arranged in a linear fashion along both sides of the covered area but the middle was full of tables and seats allowing people a rare opportunity to sit down here and eat to the sound of live music and entertainment on the makeshift stage. I found some absolute treats for dessert in the form of The Vegan Tart, who did a fragrant, floral, lavender ball (those who know me will tell you of my obsession with lavender-flavoured food). My sister doesn’t like it – she says its scent reminds her of grannies. Perhaps it does but some flowers were born to be in food. Another such flower is rose and I have no idea how they manage to create a dairy-free, rose petal cake that tastes so creamy and rich. 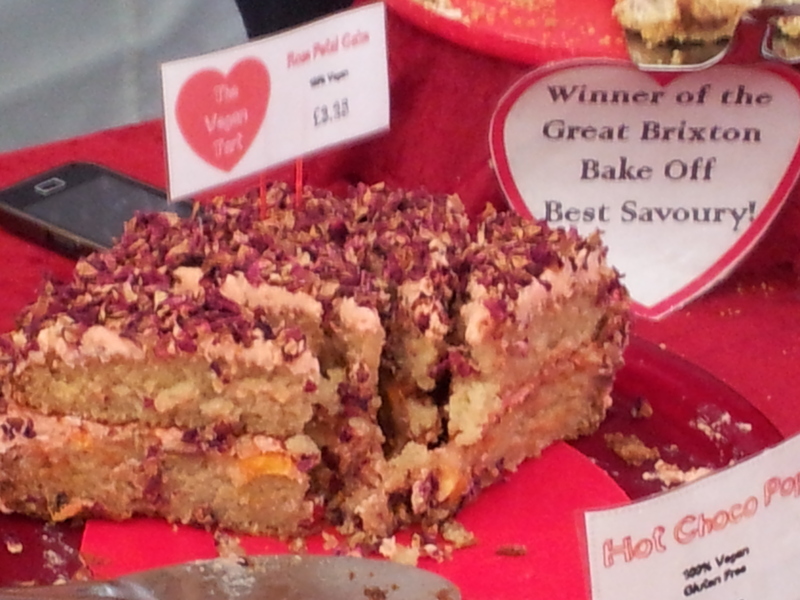 I’m not even vegan and yet the cake was divine and every bit as scrumptious in the mouth as it was easy on the eye! 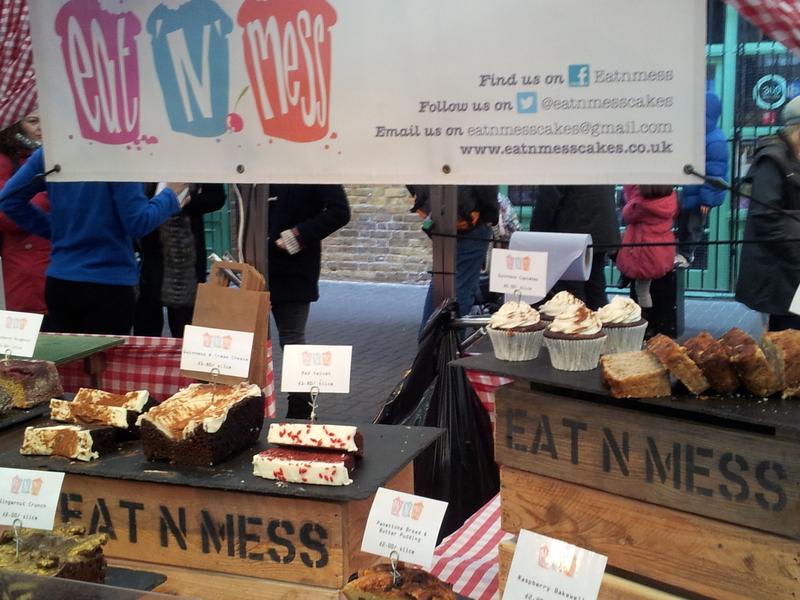 Equally intriguing was Bad Brownie, who made the mistake of telling me they also stock in Maltby Street Market and have a store in central London. 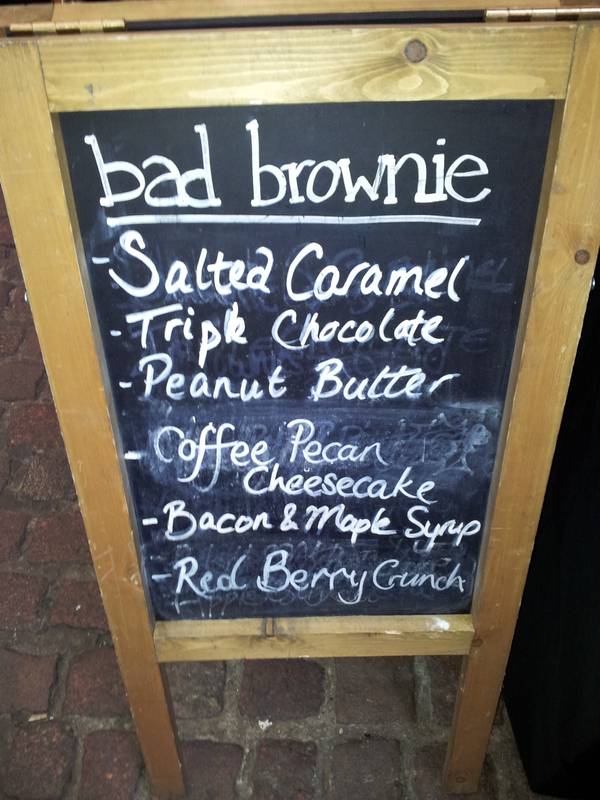 I asked for help choosing brownies – I was stuck between salted caramel, peanut butter and bacon and maple syrup….in a brownie? Seriously? I was told that these all fit with the same taste preferences – a penchant for the sweet and salty. I was too intrigued by the bacon and maple syrup to let the moment pass but when the tradesman told me his favourite of the three was salted caramel, I just couldn’t leave it behind. So I bought both. It is for charity after all. They packed them away for me and threw in a loyalty card while they were at it. I must have had “brownie addict” stamped across my forehead. I can’t even deny it. Those of you with coeliac tendencies should head to Eat N Mess for their wide selection of gluten-free cakes; the white chocolate blondies and red velvet cake looked particularly tempting; those whose guts can tolerate gluten nicely can also glance at the delicacies made by Comptoir Gourmand. 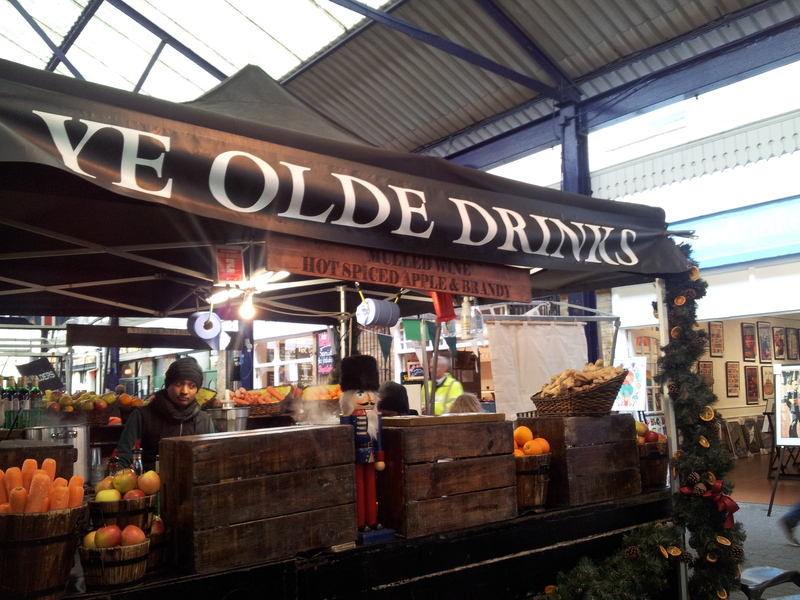 And on a cold day, the warm, spiced, apple drink at Ye Olde Drink was just what I needed to get my circulation moving. I’m not sure if or when this will be back, as this was the first time they hosted this event here in Greenwich but I felt I had to share some of these special foodie finds with you and celebrate the initiative of a group of enthusiastic, passionate youngsters (now I sound like a grandma), who put heart, soul and some serious organisational skills into arranging this event for a great cause. If any of them are reading this, please do organise it again next year! Arggghhhh I live in Greenwich I didn’t even know about this event! Shame on me! On a happier note it’s really nice to read that the proceeds go to Greenwich Food Bank. 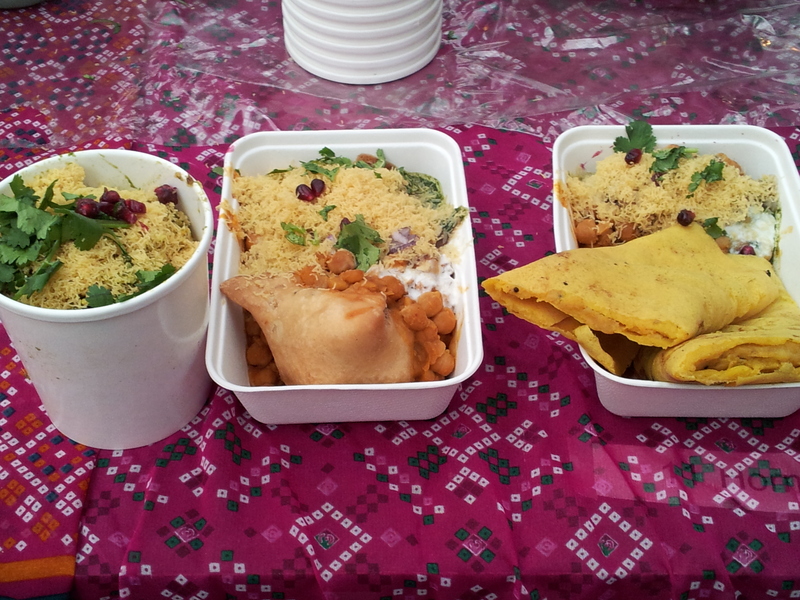 I would have been all over that Indian food stall, the photos look gorgeous! However, usually I can be seen scoffing my face at the Ethiopian food stall in Greenwich Market – the lentil soup and veggie Sambosas are a must! One of my favourite parts of London just a shame I live on the opposite side! yes that’s the thing about London isn’t it – traversing it from one side to another is sometimes more time consuming than getting out of London and into another country!! I just discovered Bad Brownies today and they’re so bad. And by that I mean soooo good! Yes – sinfully good aren’t they?! What flavour did you go for? I really need to get back & try a peanut butter one! Thanks for the lovely mention here!And yes you must come back for peanut butter – our second best seller with crunchy peanut butter inside, smooth on top, with peanut brittle and roasted peanuts for some extra crunch – heaven! Pingback: 10 Reasons to Love Greenwich and Blackheath, London | Why Waste Annual Leave?